Woodworking is one of the most satisfying and engaging creative activities on the planet. It’s so much fun to start out with a pile of boards and end up with a finished project. If you’ve ever watched one of those DIY shows on television, it all looks so easy, reliable and step by step. Woodworking is reliable, easy and step by step but it takes practice. By starting out with smaller projects, a person has the opportunity to develop the basic skills needed to successfully complete bigger ones. Having a set of plans to follow is essential for all beginners. When I first started woodworking and repairs, it was out of necessity- I simply did not have the resources to hire someone. In doing repairs, the most important skill I had to master was measuring. Most of the tape measures on the market today are actually 1/16th of an inch long to allow for the width of a saw blade so that when you cut on your “mark” you end up with the desired length. It’s always easier to cut something right the first time. Almost any woodworking course will tell you, measure twice-cut once. Just as important as measuring twice is checking to make sure that where you’re measuring from is square or even. We’ll go over some basic tools that you’ll need and rely on to help you accomplish this. In the beginning you won’t need the most expensive tools on the market, but buying good quality tools will save you money in the long run. Once you start working with wood, you’ll realize that materials in a project will be your biggest expense. The most important tool to have on hand for any project! Most will fit over prescription glasses, all have the potential of saving you from blindness. The most important goal of any project is safety first!! Some gloves are actually a safety hazard as they can get trapped in moving tools and drag your hand into danger. I always use tight fitting nitrile gloves while working with any project. They will tear if you get them caught on something, stop you from getting most splinters and protect you from chemically treated wood (pressure treated) result in dermal absorption of harsh chemicals. A yardstick will not suffice. A keychain retractable tape will not suffice. Buy a good 25 foot tape measure that is retractable, that will not retract automatically. The numbers and lines should be large enough to read and see from at least 8 feet away. Remember when you do retract it to let it come to rest easily instead of snapping back inside as doing so will eventually break the end off. A framers speed square is what you’ll be looking for, the plastic ones will do to start but eventually you’ll want to get a good metal one. They come in different sizes depending on the size stock you’ll be working with–usually 6″ & 12″ would be good to have on hand. A good snap blade utility knife with a blade lock will come in handy for cleaning up any cuts that splinter. The lead is bigger, a little softer and usually will make a mark the same width as your saw blade. The #2 pencils you may be used to using are often hard enough to score the wood and will leave a line that will have to be sanded out if you need to correct your mark. This is where things get a little tricky. Which power tools you actually need depend on what you plan to build. If you’re building doll houses, bird feeders and small projects, you won’t need much. Most of the home improvement stores will cut plywood for you for a fee. They do not promise accuracy, some centers are better than others but they all have one thing in common–finishing your task and moving on to the next. Many home improvement centers offer a battery operated combo kit that will include a small circular saw, a drill, sander etc. These are fine for small projects and are quite handy. Make certain to get a set with lithium ion batteries or you’ll be stopping mid project (maybe even mid cut) to change or charge batteries. These small saws are good for thinner materials or a limited amount of cutting on thicker ones. The drills with these kits are often strong enough to go all day and double as screw drivers too. Often these kits include a sawz-all, or reciprocating blade saw. Unless you’re experienced with using one, it’s a little harder to get a straight cut with these. If your plan is to build larger projects, go ahead and get a median priced circular saw that feels comfortable in your hand. Always get one with 7 1/4″ blade. The smaller blade saws are cute and serve a purpose but are limited in some ways–the small blades are more expensive too. Blades are a whole other subject–to start with a good crosscut blade is okay and usually comes with the saw. Later you may want to pick up additional blades for cutting plywood or fine work. 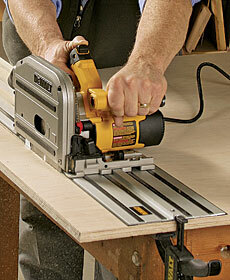 If you’ve never used a circular saw, pick up some cull lumber to practice on at your local home improvement center. If you mess something up (and you will) it’s not a big deal. Most of the cordless/battery operated drills will suffice for any beginner, just make sure to get the higher voltage tool (at least 18volt) with lithium ion batteries. Many of the kits come complete with driver tips and drill bit sets that simply snap in & out of the driver tip. It’s easy to drill a pilot hole, snap the drill bit out, insert the appropriate screw driving tip and move on. When working on small or large projects it’s often useful to have a brad nailer on hand, one squeeze of the trigger, the material is nailed and it’s easy! Make a mistake with a brad nailer? no problem, just pull the brad out with a pair of players or nippers and start again. Electric corded brad nailers are very reasonable in price, and many of the battery operated tool sets discussed include a brad nailer. Many brad nailers will also drive staples, a handy feature for other projects too. Another option to keep in mind is tool rental . It’s a good way to try out a type of tool to see if it’s really something that you want to own. One of the best parts about tool rental is that often times the vendor will educate you on how to use what you’ve rented, show you as well as tell you. One project may call for a band saw to cut out decorative trim. It may be that you enjoy the band saw and want to buy one or that you’ll never do another project that requires one. In conclusion, woodworking is a wonderful hobby, an art form, and just plain fun! It can be an expensive adventure but the price of satisfaction is worth the investment. In the beginning it’s best to work with ready made plans. Even for experienced woodworkers, the set-up of a project and drafting out a plan is tedious, detailed and frustrating. A good set of plans will have a materials list complete with sizes and descriptions, a set of instructions on how to assemble the project and a list of all the hardware needed. A few dollars spent on a set of plans expedites the project enormously. It’s fun to start a project knowing exactly what you need and have it on hand in advance. One of the best sources for plans, 16,000 of them is at Ted’s Woodworking. Click Here! But remember that before you can get started, you need to be aware of what tools and equipment you need before choosing among beginner woodworking projects. Welcome to the world of woodworking!